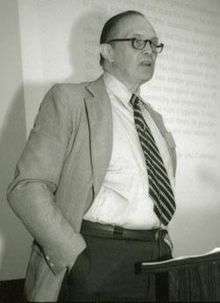 George Armitage Miller (February 3, 1920 – July 22, 2012) was one of the founders of the cognitive psychology field. He also contributed to the birth of psycholinguistics and cognitive science in general. Miller wrote several books and directed the development of WordNet, an online word-linkage database usable by computer programs. He authored the paper, "The Magical Number Seven, Plus or Minus Two," in which he insightfully observed that many different experimental findings considered together reveal the presence of an average limit of seven for human short-term memory capacity. This paper is frequently cited in both psychology and the wider culture. He also won awards, such as the National Medal of Science. Miller started his education focusing on speech and language and published papers on these topics, focusing on mathematical, computational and psychological aspects of the field. He started his career at a time when the reigning theory in psychology was behaviorism, which eschewed any attempt to study mental processes and focused only on observable behavior. Working mostly at Harvard University, MIT and Princeton University, Miller introduced experimental techniques to study the psychology of mental processes. He went on to be one of the founders of psycholinguistics and was then one of the key figures in founding the broader new field of cognitive science, circa 1978. He collaborated and co-authored work with other figures in cognitive science and psycholinguistics, such as Noam Chomsky. For moving psychology into the realm of mental processes and for aligning that move with information theory, computation theory, and linguistics, Miller is considered one of the great twentieth-century psychologists. A Review of General Psychology survey, published in 2002, ranked Miller as the 20th most cited psychologist of that era. Miller was born on February 3, 1920, in Charleston, West Virginia, the son of an executive at a steel company, George E. Miller, and Florence (Armitage) Miller. Soon after, his parents divorced. He grew up with only his mother during the Great Depression, attended public school, and graduated from Charleston High School in 1937. He relocated with his mother and stepfather to Washington D.C., and was at George Washington University for a year. His family practiced Christian Science, which required turning to prayer, rather than medical science, for healing. After his stepfather was transferred to Birmingham, Alabama, Miller transferred to the University of Alabama. He received his bachelor's degree in history and speech in 1940, and a master's in speech in 1941 from the University of Alabama. He had taken courses in phonetics, voice science, and speech pathology . Membership in the Drama club fostered his interest in courses in the Speech Department. He was also influenced by Professor Donald Ramsdell, who introduced him both to psychology, and, indirectly through a seminar, to his future wife Katherine James. They married on November 29, 1939. Katherine died in January, 1996. He married Margaret Ferguson Skutch Page in 2008. Miller taught the course "Introduction to Psychology" at Alabama for two years. He enrolled in the Ph.D. program in psychology at Harvard University in 1943, after coming to the university in 1942. He received his doctorate in 1946 from Harvard's Psycho-Acoustic Laboratory, under the supervision of Stanley Smith Stevens, researching military voice communications for the Army Signal Corps during World War II. His doctorate thesis, "The Optimal Design of Jamming Signals," was classified top secret by the US Army. After receiving his doctorate, Miller stayed as a research fellow at Harvard, to continue his research on speech and hearing. He was appointed assistant professor of psychology in 1948. The course he developed on language and communication would eventually lead to his first major book, Language and communication (1951). He took a sabbatical in 1950, and spent a year as a visiting fellow at the Institute for Advanced Study, Princeton, to pursue his interest in mathematics. Miller befriended J. Robert Oppenheimer, with whom he played squash. In 1951, Miller joined MIT as an associate professor of psychology. He led the psychology group at MIT Lincoln Lab. He worked on voice communication and human engineering, whereupon he identified the minimal voice features of speech required for it to be intelligible. Based on this work, in 1955, he was invited to a talk at the Eastern Psychological Association. That presentation, "The magical number seven, plus or minus two", was later published as a paper which went on to be a legendary one in cognitive psychology. Miller moved back to Harvard as a tenured associate professor in 1955 and became a full professor in 1958, expanding his research into how language affects human cognition. At the university he met a young Noam Chomsky, another of the founders of cognitive science. They spent a summer together at Stanford training the faculty, and their two families shared a house. In 1958–59, Miller took leave to join the Center for Advanced Study in the Behavioral Sciences at Palo Alto, California, (now at Stanford University). There he collaborated with Eugene Galanter and Karl Pribram on the book Plans and the Structure of Behavior. In 1960, along with Jerome S. Bruner, he co-founded the Center for Cognitive Studies at Harvard. The cognitive term was a break from the then-dominant school of behaviorism, which insisted cognition was not fit for scientific study. The center attracted such notable visitors as Jean Piaget, Alexander Luria and Chomsky. Miller then became the chair of the psychology department. Miller was instrumental at the time for recruiting Timothy Leary to teach at Harvard. Miller knew Leary from the University of Alabama, where Miller was teaching psychology and Leary graduated with an undergraduate degree from the department. In 1967, Miller taught at Rockefeller University for a year, as a visiting professor, From 1968 to 1979, he was Professor at the Rockefeller University and continued as Adjunct Professor there from 1979-1982. A new president's selection at Rockefeller made him leave. He moved to Princeton University in 1979 as the James S. McDonnell Distinguished University Professor of Psychology. In 1986, he helped in founding the Cognitive Science Laboratory at Princeton. Eventually he became a professor emeritus and senior research psychologist at Princeton. He also directed the McDonnell-Pew Program in Cognitive Science. Miller had honorary doctorates from the University of Sussex (1984), Columbia University (1980), Yale University (1979), Catholic University of Louvain (1978), Carnegie Mellon University (in humane letters, 2003), and an honorary DSC from Williams College (2000). He was elected to the American Academy of Arts and Sciences in 1957, the National Academy of Sciences in 1962, the presidency of the Eastern Psychological Association in 1962, the presidency of the American Psychological Association in 1969, and to the Royal Netherlands Academy of Arts and Sciences in 1985. Miller was the keynote speaker at the first convention of the Association for Psychological Science in 1989. He was a Fulbright research fellow at Oxford University in 1964–65, and in 1991, received the National Medal of Science. In his later years, Miller enjoyed playing golf. He died in 2012 at his home in Plainsboro, New Jersey of complications of pneumonia and dementia. At the time of his death, he was survived by his wife Margaret; the children from his first marriage: son Donnally James and daughter Nancy Saunders; two stepsons, David Skutch and Christopher Skutch; and three grandchildren: Gavin Murray-Miller, Morgan Murray-Miller and Nathaniel James Miller. Miller's career started during the reign of behaviorism in psychology. Behaviorists questioned whether mental thought processes were fit for scientific study, not being observable. They focused on working with responses to stimuli, particularly among other animals. Miller disagreed. He, Jerome Bruner, and Noam Chomsky are considered the founders of the field of Cognitive Psychology that replaced behaviorism as the framework for analyzing the mind. From the days of William James, psychologists had the idea memory consisted of short-term and long-term memory. While short-term memory was expected to be limited, its exact limits were not known. In 1956, Miller would quantify its capacity limit in the paper "The magical number seven, plus or minus two". He tested immediate memory via tasks such as asking a person to repeat a set of digits presented; absolute judgment by presenting a stimulus and a label, and asking them to recall the label later; and span of attention by asking them to count things in a group of more than a few items quickly. For all three cases, Miller found the average limit to be seven items. He had mixed feelings about the focus on his work on the exact number seven for quantifying short-term memory, and felt it had been misquoted often. He stated, introducing the paper on the research for the first time, that he was being persecuted by an integer. Miller invented the term chunk to characterize the highly variable units to which the limit on memory applied. A chunk might be a single letter or a familiar word or even a larger familiar unit. Miller himself saw no relationship among the disparate tasks of immediate memory and absolute judgment, but lumped them to fill a one-hour presentation. The results influenced the budding field of cognitive psychology. For many years starting from 1986, Miller directed the development of WordNet, a large computer-readable electronic reference usable in applications such as search engines. Wordnet is a large lexical database representing human semantic memory in English. Its fundamental building block is a synset, which is a collection of synonyms representing a concept or idea. Words can be in multiple synsets. The entire class of synsets is grouped into nouns, verbs, adjectives and adverbs separately, with links existing only within these four major groups but not between them. Going beyond a thesaurus, WordNet also includes inter-word relationships such as part/whole relationships and hierarchies of inclusion.Although not intended to be a dictionary, Wordnet did have many short definitions added to it as time went on. Miller and colleagues had planned the tool to test psycholinguistic theories on how humans use and understand words. Miller also later worked closely with the developers at Simpli.com Inc., on a meaning-based keyword search engine based on WordNet. Wordnet has proved to be extremely influential on an international scale. It has now been emulated by wordnets in many different languages. Miller is considered one of the founders of psycholinguistics, which links language and cognition in psychology, to analyze how people use and create language. His 1951 book Language and Communication is considered seminal in the field. His later book, The Science of Words (1991) also focused on language psychology. He published papers along with Noam Chomsky on the mathematics and computational aspects of language and its syntax, two new areas of study. Miller also researched how people understood words and sentences, the same problem faced by artificial speech-recognition technology. The book Plans and the Structure of Behavior (1960), written with Eugene Galanter and Karl H. Pribram, explored how humans plan and act, trying to extrapolate this to how a robot could be programmed to plan and do things. Miller is also known for coining Miller's Law: "In order to understand what another person is saying, you must assume it is true and try to imagine what it could be true of". Miller authored several books, many considered the first major works in their respective fields. Miller's Language and Communication was one of the first significant texts in the study of language behavior. The book was a scientific study of language, emphasizing quantitative data, and was based on the mathematical model of Claude Shannon's information theory. It used a probabilistic model imposed on a learning-by-association scheme borrowed from behaviorism, with Miller not yet attached to a pure cognitive perspective. The first part of the book reviewed information theory, the physiology and acoustics of phonetics, speech recognition and comprehension, and statistical techniques to analyze language. The focus was more on speech generation than recognition. The second part had the psychology: idiosyncratic differences across people in language use; developmental linguistics; the structure of word associations in people; use of symbolism in language; and social aspects of language use. Reviewing the book, Charles E. Osgood classified the book as a graduate-level text based more on objective facts than on theoretical constructs. He thought the book was verbose on some topics and too brief on others not directly related to the author's expertise area. He was also critical of Miller's use of simple, Skinnerian single-stage stimulus-response learning to explain human language acquisition and use. This approach, per Osgood, made it impossible to analyze the concept of meaning, and the idea of language consisting of representational signs. He did find the book objective in its emphasis on facts over theory, and depicting clearly application of information theory to psychology. In Plans and the Structure of Behavior, Miller and his co-authors tried to explain through an artificial-intelligence computational perspective how animals plan and act. This was a radical break from behaviorism which explained behavior as a set or sequence of stimulus-response actions. The authors introduced a planning element controlling such actions. They saw all plans as being executed based on input using a stored or inherited information of the environment (called the image), and using a strategy called test-operate-test-exit (TOTE). The image was essentially a stored memory of all past context, akin to Tolman's cognitive map. The TOTE strategy, in its initial test phase, compared the input against the image; if there was incongruity the operate function attempted to reduce it. This cycle would be repeated till the incongruity vanished, and then the exit function would be invoked, passing control to another TOTE unit in a hierarchically arranged scheme. Peter Milner, in a review in the Canadian Journal of Psychology, noted the book was short on concrete details on implementing the TOTE strategy. He also critically viewed the book as not being able to tie its model to details from neurophysiology at a molecular level. Per him, the book covered only the brain at the gross level of lesion studies, showing that some of its regions could possibly implement some TOTE strategies, without giving a reader an indication as to how the region could implement the strategy. Miller's 1967 work, The Psychology of Communication, was a collection of seven previously published articles. The first "Information and Memory" dealt with chunking, presenting the idea of separating physical length (the number of items presented to be learned) and psychological length (the number of ideas the recipient manages to categorize and summarize the items with). Capacity of short-term memory was measured in units of psychological length, arguing against a pure behaviorist interpretation since meaning of items, beyond reinforcement and punishment, was central to psychological length. The second essay was the paper on magical number seven. The third, 'The human link in communication systems,' used information theory and its idea of channel capacity to analyze human perception bandwidth. The essay concluded how much of what impinges on us we can absorb as knowledge was limited, for each property of the stimulus, to a handful of items. The paper on "Psycholinguists" described how effort in both speaking or understanding a sentence was related to how much of self-reference to similar-structures-present-inside was there when the sentence was broken down into clauses and phrases. The book, in general, used the Chomskian view of seeing language rules of grammar as having a biological basis—disproving the simple behaviorist idea that language performance improved with reinforcement—and using the tools of information and computation to place hypotheses on a sound theoretical framework and to analyze data practically and efficiently. Miller specifically addressed experimental data refuting the behaviorist framework at concept level in the field of language and cognition. He noted this only qualified behaviorism at the level of cognition, and did not overthrow it in other spheres of psychology. The Cognitive Neuroscience Society established a George A. Miller Prize in 1995 for contributions to the field. The American Psychological Association established a George A. Miller Award in 1995 for an outstanding article on general psychology. From 1987 the department of psychology at Princeton University has presented the George A. Miller prize annually to the best interdisciplinary senior thesis in cognitive science. The paper on the magical number seven continues to be cited by both the popular press to explain the liking for seven-digit phone numbers and to argue against nine-digit zip codes, and by academia, especially modern psychology, to highlight its break with the behaviorist paradigm. Miller was considered the 20th most eminent psychologist of the 20th century in a list republished by, among others, the American Psychological Association. Distinguished Scientific Contribution award from the American Psychological Association (APA) in 1963. Distinguished Service award from the American Speech and Hearing Association, 1976. Award in Behavioral Sciences from the New York Academy of Sciences, 1982. William James fellow of the American Psychological Society, 1989. Hermann von Helmholtz award from the Cognitive Neurosciences Institute, 1989. Gold Medal from the American Psychological Foundation in 1990. National Medal of Science from The White House, 1991. Louis E. Levy medal from the Franklin Institute, 1991.
International Prize from the Fyssen Foundation, 1992. William James Book award from the APA Division of General Psychology, 1993. John P. McGovern award from the American Association for the Advancement of Science, 2000. Outstanding Lifetime Contribution to Psychology award from the APA in 2003. Antonio Zampolli Prize from the European Languages Research Association, 2006. — (1963). Language and Communication. McGraw Hill. ASIN B000SRSOIK. — (1965). Mathematics and Psychology (Perspectives in Psychology). John Wiley & Sons. ISBN 9780471604082. Frank Smith; George A Miller (1968). The Genesis of Language: A Psycholinguistic Approach. The MIT Press. ISBN 978-0262690225. George A. Miller, ed. (1973). Communication, Language and Meaning (Perspectives in Psychology). Basic Books. ISBN 9780465128334. — (1974). Linguistic Communication: Perspectives for Research. International Reading Association. ISBN 978-0872079298. — (1975). The Psychology of Communication. Harper Androw-1975. ISBN 978-0465097074. George A. Miller; Philip N Johnson-Laird (1976). Language and Perception. Harvard University Press. ISBN 978-0674509474. George A. Miller; Eugene Galanter; Karl H. Pribram (1986). Plans and the Structure of Behavior. Adams Bannister Cox Pubs. ISBN 0937431001. — (1987). Spontaneous Apprentices: Children and Language (Tree of Life). Seabury Press. ISBN 978-0816493302. — (1987). Language and Speech. W H Freeman & Co (sd). ISBN 978-0716712978. — (1991). Psychology: The Science of Mental Life. Penguin Books Ltd. ISBN 9780140134896. — (1991). The Science of Words. W H Freeman & Co. ISBN 978-0716750277. Miller, George A.; Galanter, Eugene (1960), "Some comments on Stochastic models and psychological theories", in Arrow, Kenneth J.; Karlin, Samuel; Suppes, Patrick, Mathematical models in the social sciences, 1959: Proceedings of the first Stanford symposium, Stanford mathematical studies in the social sciences, IV, Stanford, California: Stanford University Press, pp. 277–297, ISBN 9780804700214. 1 2 3 4 5 6 7 8 9 Paul Vitello (August 1, 2012). "George A. Miller, a pioneer in cognitive psychology, is dead at 92". New York Times. Retrieved August 8, 2012. 1 2 3 4 5 6 7 8 9 10 11 12 13 14 15 16 17 "Profie details: George Armitage Miller". Marquis Who's Who. Retrieved August 7, 2012. 1 2 3 4 5 6 7 8 9 10 11 12 13 14 No Authorship Indicated (1991). "Gold medal awards for life achievement: George Armitage Miller". American Psychologist. 46 (4): 326.328. doi:10.1037/0003-066X.46.4.326. 1 2 3 4 5 Thomas M. Haugh II (August 6, 2012). "George A. Miller dies at 92; pioneer of cognitive psychology". Los Angeles Times. Retrieved August 8, 2012. 1 2 Emily Langer (August 3, 2012). "George A. Miller; helped transform the study of psychology; at 92". Washington Post. Retrieved August 8, 2012. ↑ Pais A. (2006). J. Robert Oppenheimer: A life. Oxford University Press. p. 89. 1 2 3 4 Richard Hébert (July 2006). "The Miller's tale". American Psychological Society. Retrieved August 10, 2012. ↑ Lindzey, G. (1989). A History of psychology in autobiography. Stanford University Press. ↑ "Preeminent leaders awarded honorary degrees". Carnegie Mellon University: Carnegie Mellon Today. May 13, 2003. Retrieved August 23, 2012. ↑ "Honorary degrees". Williams University: Office of the President. Retrieved August 23, 2012. 1 2 3 4 5 6 Michael Hotchkiss (July 26, 2012). "George Miller, Princeton psychology professor and cognitive pioneer, dies". Retrieved August 10, 2012. ↑ "G.A. ('George') Miller (1920 - 2012)". Royal Netherlands Academy of Arts and Sciences. Retrieved 17 July 2015. ↑ "The history of APS: A timeline". Association for Psychological Science. Retrieved August 22, 2012. ↑ Daniel Shiffman. "Daniel Shiffman: WordNet". Retrieved August 10, 2012. ↑ Sampson, Geoffrey (2000). "Reviews". International Journal of Lexicography. 13 (1): 54.9. doi:10.1093/ijl/13.1.54. ↑ "Beyond keyword searching.Oingo and Simpli.com introduce meaning-based searching". December 20, 1999. Retrieved August 10, 2012. ↑ "George A. Miller". Encyclopedia Britannica. Retrieved August 8, 2012. ↑ N. Chomsky; George A. Miller (1957). Pattern Conception (Technical report). ASTIA. Document AD110076. ↑ Noam Chomsky; George A. Miller (1958). "Finite State Languages" (PDF). Inform. and Control. 1: 91–112. doi:10.1016/s0019-9958(58)90082-2. ↑ N. Chomsky; George A. Miller (1962). "Introduction to the Formal Analysis of Natural Languages". In R.R. Bush and E. Galanter and R.D. Luce. Handbook of Mathematical Psychology. 2. Wiley. pp. 269–321. ↑ Robert J. Banis (September 8, 2007). "BA 3320.Introduction to operations management". Retrieved August 10, 2012. 1 2 3 4 Osgood, C. E. (1952). "Language and communication". Psychological Bulletin. 49 (4): 361.363. doi:10.1037/h0052690. 1 2 Smith, S.M. (1952). "Language and Communication". Journal of Abnormal and Social Psychology. 47 (3): 734–735. doi:10.1037/h0052503. 1 2 3 Milner, P. M. (1960). "Review of Plans and the Structure of Behavior". Canadian Journal of Psychology. 14 (4): 281.82. doi:10.1037/h0083461. ↑ Wallace, A.F.C (1960). "Plans and the structure of behavior: Review". American Anthropologist. 62 (6): 1065–1067. doi:10.1525/aa.1960.62.6.02a00190. 1 2 3 Bunge, Mario (1968). "Reviews: George A. Miller: The Psychology of Communication". The British Journal for the Philosophy of Science. 18 (4): 350.52. doi:10.1093/bjps/18.4.350. ↑ "Georage A. Miller: The Psychology of Communication: Seven Essays: Review". Journal of Business Communication. 5 (2): 54–55. 1968. doi:10.1177/002194366800500208. ↑ "George A. Miller Prize in cognitive neuroscience". Cognitive Neuroscience Society. Retrieved August 10, 2012. ↑ "George A. Miller Award for an Outstanding Recent Article on General Psychology". American Psychological Association. Retrieved August 10, 2012. ↑ "George A. Miller Sr. Thesis Prize". Department of Psychology, Princeton University. 2004. Retrieved August 10, 2012. ↑ "Sidebar: Eminent psychologists of the 20th century". Monitor on Psychology. 33 (7): 29. 2002. ↑ "LREC 2006 Conference: Winners of the 2006 Antonio Zampolli Prize". LREC. 2006. Retrieved August 10, 2012.